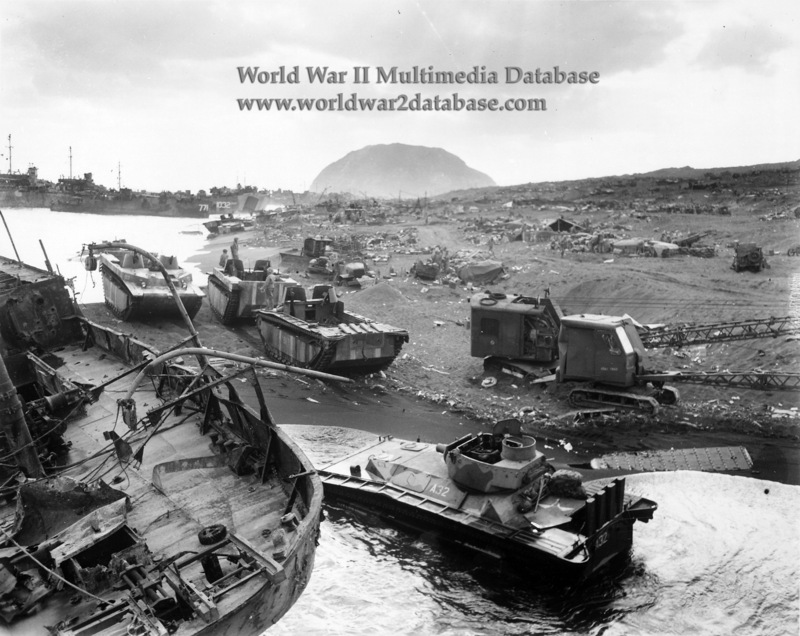 Landing Boats, LVT(A)-4 Amtracs, LVT-4 Amtracs, cranes, and debris litter the beach in front of Marine bivouacs. LST-1032 and LSM-771 are in the background. Mount Suribachi dominates the area. The morning light on D+1 revealed the discouraging sights of the chaos created along the beaches by the combination of Iwo Jima's wicked surf and unrelenting Japanese barrages. In the words of one dismayed observer: "The wreckage was indescribable. For two miles the debris was so thick that there were only a few places where landing craft could still get in. The wrecked hulls of scores of landing boats testified to one price we had to pay to put our troops ashore. Tanks and half-tracks lay crippled where they had bogged down in the coarse sand. Amphibian tractors, victims of mines and well-aimed shells, lay flopped on their backs. Cranes, brought ashore to unload cargo, tilted at insane angles, and bulldozers were smashed in their own roadways." Bad weather set in, further compounding the problems of general unloading. Strong winds whipped sea swells into a nasty chop; the surf turned uglier.